A SUPER-VOLCANO in California which erupted with devastating results hundreds of thousands of years ago has a vast reservoir of semi-molten magma measuring a staggering 240 cubic MILES, a new study has suggested. 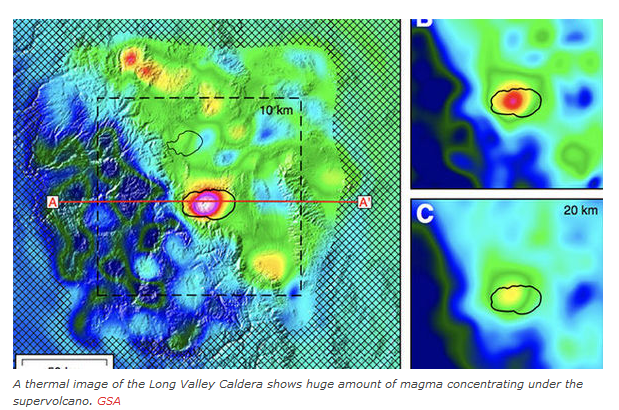 The amount of magma in the Long Valley Caldera is so large it could support an eruption equivalent to the massive one which occurred 767,000 years ago, which released 140 cubic miles of material into the atmosphere. 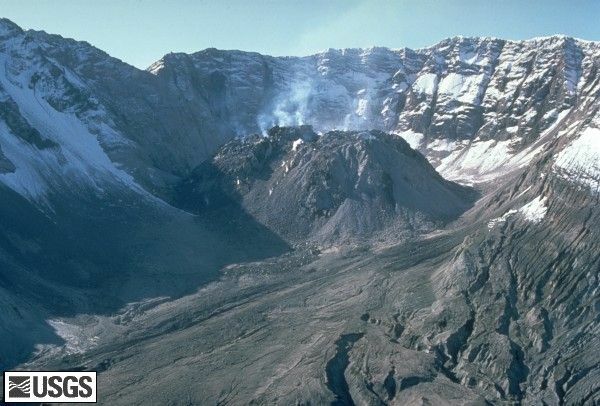 y comparison, the 1980 Mount St Helens eruption resulted in the release of 0.29 cubic miles. The Long Valley Caldera is one of the Earth’s largest calderas, measuring about 20 miles long, 11 miles wide and up to 3,000 feet (910 m) deep. 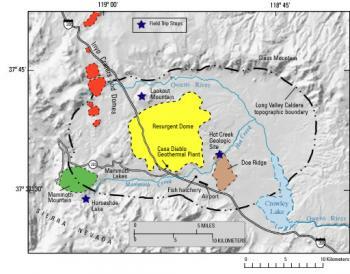 After four strong earthquakes shook the Long Valley area in 1980, USGS scientists also detected evidence of renewed volcanic unrest in the region. They subsequently found that the central part of caldera was slowly rising. Geologists have found that after its creation in the massive eruption 760,000 years ago, clusters of smaller volcanic eruptions have occurred in the caldera at roughly 200,000-year intervals. About 100,000 years ago, the most recent of these eruptions formed the Mammoth Knolls, low hills just north of the Town of Mammoth Lakes. Mammoth Mountain, a young volcano on the rim of Long Valley Caldera, was created by a series of eruptions which occurred between 220,000 and 50,000 years ago. Volcanoes in the Mono-Inyo Craters volcanic chain, which extends from just south of Mammoth Mountain to the north shore of Mono Lake in Mono County, California, have erupted frequently over the course of the last 40,000 years. During the last 5,000 years, an eruption has occurred somewhere along this chain every 250 to 700 years. The nearby Inyo Craters and associated lava domes were the result of a series of small to moderate eruptions 550 to 600 years ago, while the most recent eruptions along the volcanic chain took place about 250 years ago at Paoha Island in Mono Lake. Long Valley Caldera, Yellowstone Caldera are superimposed.